FREE native plant course– attract pollinators to your yard! Update: We’ve filled our course! Thanks for all those who are interested. Given the number of requests we received, we will almost certainly offer another course later in the year, so keep an eye out as the season progresses. 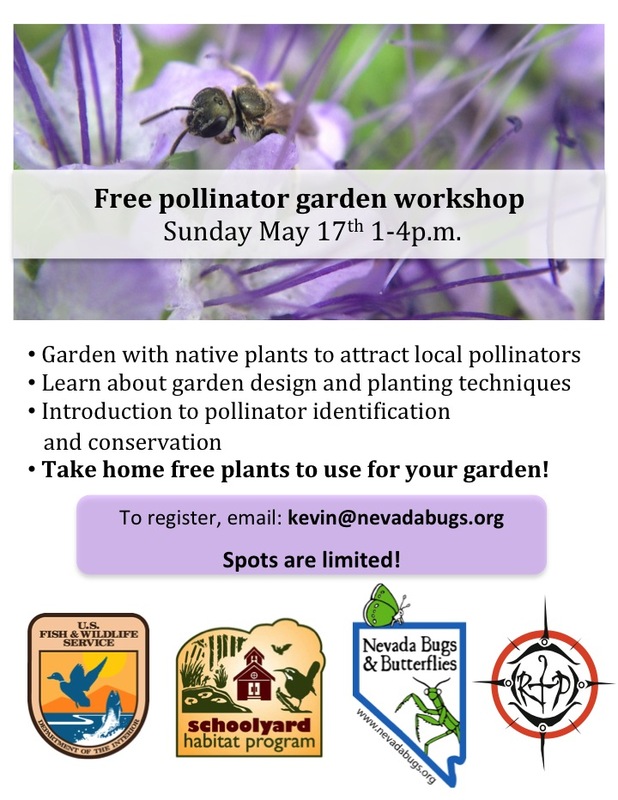 We are proud to announce a free native plant course taking place out at our butterfly house on May 17th 1-4pm, created as a partnership between Nevada Bugs, the US Fish & Wildlife Schoolyard Habitat program, and RT Permaculture. The topic of this course will be using plants native to Nevada to attract the many different types of beneficial insects that are in our area. Topics will include plant choice and planting techniques that will maximize your site’s usefulness to native insects, an introduction to native insect identification and conservation, and a special highlight on monarch butterfly conservation. Our site owner, Neil, will also lead a tour of his 1-acre permaculture garden, which has many great examples of how to use native plants to attract beneficial insects. In addition, you’ll go home with a set of native plants to plant at your home– for free! Native insects have several important functions for natural areas and your own back yard– pollination of many crops, control of pest insects, and nutrient cycling to name a few. Many native insect species, like our native bumblebees, are threatened by habitat loss as well as habitat fragmentation, where each habitat patch becomes smaller and less connected to other patches. Increasing pollinator-friendly plants and creating habitat for insects are the best ways to conserve the native species that help make our landscape productive, diverse, and unique. Native plants will also use less water, remain hardier, and be more pest and disease-resistant than many nonnative plants. The course size is limited, so email Kevin to reserve your spot and help make a difference in conserving our native plants and pollinators!